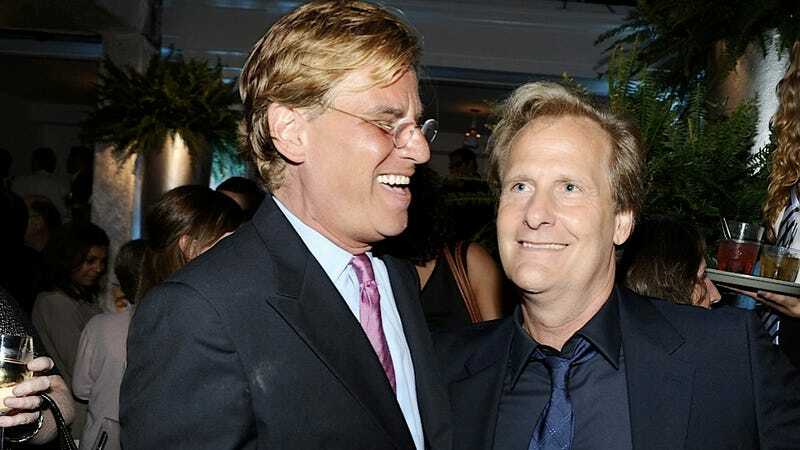 At a Wednesday session of this summer's Television Critics Association press tour, Aaron Sorkin took the stage alongside Newsroom accomplices Jeff Daniels and executive producer Alan Poul to pedantically explain to critics and journalists who, on the whole, don't much care for his new show that The Newsroom is actually awesome. Vulture's Denise Martin notes that, among the many topics Sorkin touched on during the session, he kept making the point that the show, contrary to what critics like the New Yorker's Emily Nussbaum have written, doesn't have "a woman problem." Caring about things other [sic] than yourself, reaching high, being thoughtful, curious, plainly smart, being a great team player, those are to me what define these characters. Once you have those things down, you can have them slip on as many banana peels as you want. After you've got that down, it's permissible for her to make a mistake, that I know I've made, with an email. I disagree that all she does is apologize to Will. She's talking about cheating on Will there, not ‘I'm sorry I'm doing bad in the newsroom.' She's talking about something worth apologizing for. That's not slipping on a banana peel. Do you see? Aaron Sorkin can too write complex female characters, and he'll prove it to you by explaining how complicated and nuanced they really are, so nuanced, in fact, that your brain couldn't even deal with all the nuance when you were actually watching the show.